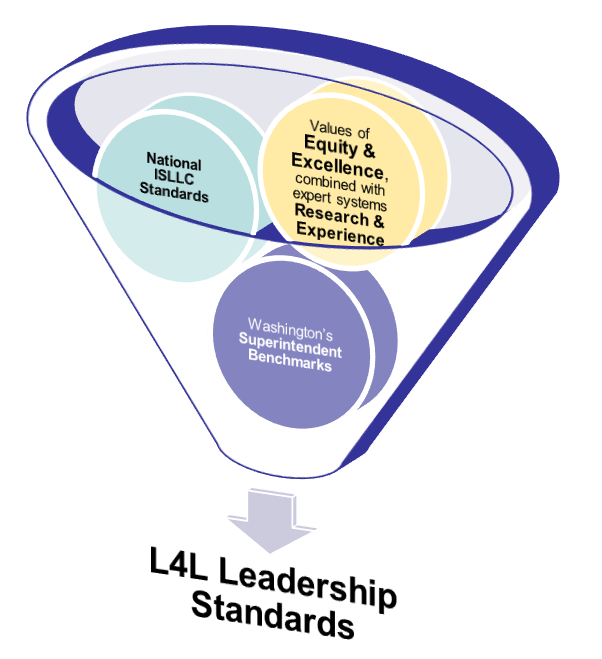 Rigorous program standards guide the Leadership for Learning curriculum. Aligned with state and national standards, the L4L Leadership Standards extend these criteria to emphasize key leadership elements, such as equity and excellence for each and every student. When systems-focused leaders demonstrate leadership for Equity & Excellence, they facilitate collective action to transform systems towards educational justice in partnership with students, families, communities, systems-based actors, and other stakeholders. Explicitly model critical and continuous self-reflection in ways that reveal how their own identities, biases, and positionality reinforce educational inequities and the extent to which changes in their practice truly interrupt them. Foster collective action to disrupt and decrease race, class, language, culture, ability, gender, sexuality, citizenship, and other group-based disparities and to ensure that the needs, interests, and assets of non-dominant students are central in change efforts. Balance power in decision-making across multiple voices—educator, family, community, and students— to improve learning environments and outcomes for each student. Demonstrate transparent and ethical leadership and engage conflict productively and equitably. When systems-focused leaders demonstrate Inquiry and Data-informed Leadership, they are able to lead collective continuous improvement processes in the moment and over time in service of justice-centered systems that foster practices resulting in equitable experiences and outcomes for students. Take a cycle of inquiry approach to their core work with others by triangulating qualitative and quantitative evidence to pinpoint the learning, teaching, and leadership practices that contribute to specific educational inequities; construct evidence-based theories of action that address the systemic roots of those problems; implement the theory of action; and continuously assess progress. Routinely engage others in collecting, displaying, and making sense of existing and new forms of data to improve adult practice and student learning in service of educational equity. Lead the transformation of damage-centered data systems and data-use practices to support systemic use of data to reinforce strengths-based approaches to student and adult learning. Collaborate with students, families, and communities, especially those historically and currently marginalized by public school systems, as key participants in continuous improvement efforts. When systems-focused leaders demonstrate Leadership for High-quality Teaching and Learning, they leverage the racial and cultural identities, knowledges, and practices of students and their communities in leading the learning of adults from a teaching-and-learning stance. Lead the implementation of relevant, rigorous, inclusive, and culturally-responsive instruction beyond an individual school. Support the learning of adults through a teaching-and-learning stance in ways that increase equitable learning for each student. Intentionally lead their own learning in ways that demonstrably improve their equity-, inquiry-, instructional-, and systems-focused leadership practice. Transform the design and use of professional evaluation systems and instructional frameworks to ensure the systems take an assets-based approach that reinforces principals’ and teachers’ growth and promises to improve student experiences and outcomes. When leaders demonstrate Leadership for Equitable Systems, they interrupt and transform interactions, institutional practices, and structural inequities that perpetuate historical systems of power and oppression. Draw from historical precedents and research to understand, disrupt, and shift systems towards equitable learning for each student. Design and lead the implementation of law and policies in the service of equitable learning for each student. Generate, allocate, and lead the management of resources to disrupt institutional and structural inequities and increase opportunities for those marginalized by school systems. Identify, engage, and influence legal and governance structures in service of equitable learning for each student.